i've been trying to devote my fridays to finishing projects that i have underway. but it seems that every friday, when i should be sitting down to do that, my mind wanders off to something new. today, i had a hankering to make a cake. sabin and i have been watching ultimate cake off, with the ambitious 5' tall structures of cake and fondant, but i wanted to do something a bit more simple. but still with a twist. i decided to make a chai cake. and i began searching for recipes online. the more i looked, the more i thought that i could come up with something myself. so i embarked on an experiment. it's a pretty good instant chai mix (tho' a bit sweet for my taste as a drink), that you mix with hot water. i thought it would taste delicious as a cake. i started with a martha stewart butter cake as my base - martha knows her cakes and they always have lots of real ingredients - like butter and loads of eggs and they never call for a box cake mix (very surprising how many cake recipes out there do). cream the butter in the mixer using the paddle. slowly add the sugar until it's a creamy, light yellow. mix in the four eggs one at a time, mixing well between each egg. meanwhile, combine the flour, baking powder, chai mixture and salt. add the vanilla to your egg mixture. begin to add flour and milk alternating each until it's all combined in a velvety dough. butter and flour two round (9"/23cm) cake pans. i lined the very bottom with baking paper for ease of removal (i just trace around it with the pan and cut it out to fit it perfectly). i never used baking paper when i lived in the US, but i have to admit i don't know how i did without it! i really highly recommend it. bake the two cakes at 180°C/375°F for 30-40 minutes (again, my oven is faster than others, but you know yours best). take them out and leave them to cool. i would have liked to get creative on the frosting (something maple came to mind), but my family loves a good, classic vanilla buttercream, so i pleased them. cream the butter, then slowly add the powdered sugar and vanilla. add only as much milk as you need to make a creamy, spreadable consistency. this can differ based on the weather (i swear). chill for a few minutes (up to 15) in the refrigerator, then spread on the cooled cakes. we didn't decorate or anything, we just ate thick slices with a steaming mug of tea. it tasted great, but i would say it was just a tad on the dry side, but that was undoubtedly because i baked it a bit too long. better to under bake just a titch than overbake. again, i make the mistakes so you don't have to! enjoy! Maybe I should bake a cake for the weekend as well. yum!! that looks wonderful - so is the taste mostly like a basic spice cake? Oohh looks like a must try, gotta find some chai! Oh my. This is right up my alley. 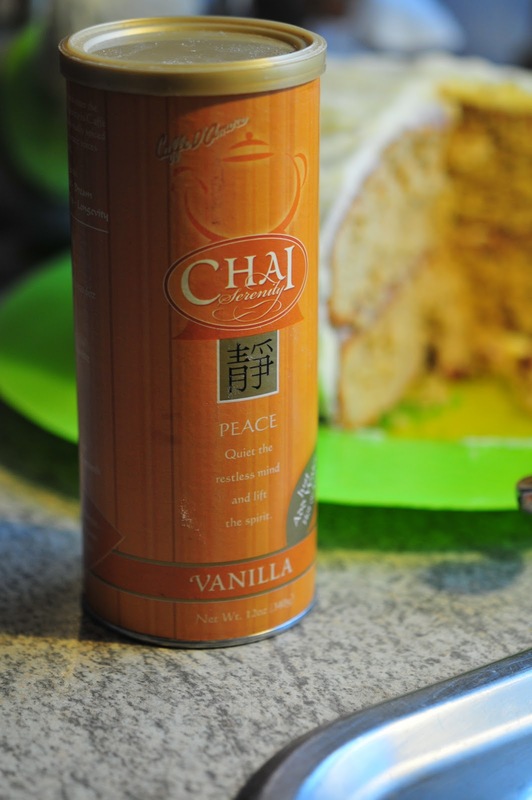 I happen to have some chai mix from Trader Joe's at home, so there's a good chance that I'll be making this cake this weekend. The TJ's mix is quite sweet, so I'll probably knock the 2 cups sugar down to 1 1/2 cup. Looks lovely--can't wait to have a slice myself! It has taken me far too long to find my way here ~ just lovely. Kudos, ladies! Good for you, Julie, finding a way to use a prepared food in a different way ~ and so tasty at the same time. I have a hazelnut coffee mix that sounds much like your chai. Bet it would taste good with a mocha butter icing. Hmmmm and yummm....Thanks for the inspiration! Looks so good and I love the y'all! Could make this for my family and take a small bite for myself. This is great! I have to try something like it sometime. I'm going to make this for Camille. Chai tea is her drink. Having eaten it, what sort of frosting would you try . . . if family preference didn't have to be considered? 1. it kept like a dream - it didn't dry out and stayed delicious throughout the three days it lasted around here. i was rather surprised by this given that i was afraid i'd baked it a tad too long and let it get a bit too dry. 2. i polled the family about the frosting...they loved it as it was, but said there should have been more frosting in the middle. next time, i will solve this by baking it in 3 layers, as i think making the frosting really thick in the middle will give you issues in cutting it properly. 3. as for myself on the frosting front, i'd still like to try something with maple syrup in it...perhaps just a spoonful or two in a butter cream, as i think that maple flavor would be good with the cake. a cream cheese frosting would be good too, but i have to say the butter cream pretty much rocked it. 4. char is right, it really is just kind of a spice cake. tho' i have to say it really did taste like chai. what is a domestic sensualist? what is a not a domestic sensualist? ~ "pasteurized, processed cheese product"